An ancient Japanese proverb states, “The nail that sticks up will be hammered down.” Japanese tradition has revolved for centuries around the concept that groups of people must work together to accomplish goals. Not only is a heightened sense of individualism considered an immature viewpoint on life, it is fundamentally dangerous to society. To call a man “decisive” or a woman “opinionated” in Japan is not a compliment; it is downright insulting. Yet despite the fierce collectivism that seems so characteristic of Japanese culture, there is often more tension between individual will and collective responsibility than is apparent on the surface. Western influences, most significantly engendered during the American occupation of Japan following World War II, continue to show their strength in the country’s capitalist economy, as well as in its people’s rabid consumption of American pop culture. According to Youichi Ito’s study “Theories of Communication Style from a Japanese Perspective: A Sociological Approach,” a number of sociological experiments have even suggested that Japanese persons are actually less likely to conform to authority than Americans in routine daily life despite their traditional predisposition for group-thought (244-245). Considering that Japanese culture often see-saws between a public denouncement of individualism and its private reality, how does this tension affect Japanese artistic expression in film, a medium whose origins and fundamental rules are rooted inextricably in Western philosophical ideas? Would the artists use their personal talent to support the liberation of the societal outcast, or would they rather testify to the strength of the collectivist society that has given them their sense of cultural identity? Furthermore, how do societal roles in Japan affect the lifestyle of the individuals these films depict? As a well-known supporter of individualist thought (and one of Japan’s most respected filmmakers), Akira Kurosawa works under the auspices of the mainstream “Samurai movie” to examine these themes in his epic 1954 film Shichinin no Samurai, or The Seven Samurai. Although all events of this film revolve around a small village’s attempt to defend itself from bandits, Kurosawa’s real focus over the epic’s 206 minutes is the uneasy alliance struck between the desperate village’s farmers and their impoverished samurai mercenaries. Through their often strained but determined relationship, Kurosawa explores not only the fierce tension during wartime between the needs of the community and one’s selfish instincts but also explores the implications of that tension in Japanese society as a whole. Although the development of the character Kikuchiyo is the most overt example of the individual’s struggle for identity in Japan, Kurosawa’s willingness to pay great attention to the small details causes even the actors’ physical features to reflect some insight into the film’s themes. From the first moment that we see the members of the peasant village gathered morosely at their town center (weeping out of fear and hatred of the marauding bandits), the solidarity they have with one another is reflected in their bodies, most obviously in the nearly identical style of every male villager’s hair. This detail might seem to be an insignificant coincidence at first glance, but as the plot advances, the villagers’ uniformity affords a dramatic contrast to the diversity of the samurai whose wildly different personalities are revealed by the great variance of their hairstyles. Indeed, Kurosawa’s continuous but tacit emphasis on different hairstyles indicates the importance the Japanese caste system during the 16th century placed on one’s particular societal role. As actor Takashi Shimura makes his first appearance in the film, when his character Kimbei Shimada attempts to rescue a boy from the clutches of a cornered bandit, he has his head shaven to trick the thief into thinking that he is a harmless priest bringing food. Although the villagers congratulate and thank Kimbei for his help after the boy is rescued, they do not understand what would drive a samurai to remove his hair, since he does not seem to be “rejecting the world” for a life of service, as such a gesture traditionally signifies. The irony is this: while Kimbei is only making this gesture of head-shaving to make the bandit drop his guard, his life’s journey from this point on will be characterized by selfless sacrifice. Kimbei in many ways seems to be Kurosawa’s image of the ideal Japanese citizen: imminently capable and intelligent, a powerful leader, but most important, constantly aware of the needs of his community. As soon as he commits to helping the threatened village, Kimbei’s life no longer concerns him at all: when he speculates to his servant Shichiroji that “maybe we die this time,” he does so casually, as if his survival in the context of the greater battle were irrelevant. Indeed, when he orders a band of mutinous villagers back to their posts at a particularly tense moment, he speaks for Japanese collectivism at its finest: “He who thinks only about himself will destroy himself, too!” Kimbei is willing to serve the cause of whatever master he is given until he has nothing left to give; to him, this is the highest goal to which he can aspire. Kimbei in many ways serves as a dramatic foil for The Seven Samurai’s other major character, Kikuchiyo, the aforementioned staunch individualist (portrayed by the brilliant Toshiro Mifune), whose peasant upbringing does not deter him from desiring what he perceives to be the glorious life of a samurai. Everything about Kikuchiyo marks him from the beginning as unique: his enormous and awkward katana; his thick, scraggly beard and hair; and the fact that he alone among the samurai was raised poor and is marked as the only triangle on Heihachi’s war banner. He cannot ultimately fit in with the samurai, because he understands the peasants too well (when the samurai grow angry at the villagers for having taken armor from samurai they killed, only Kikuchiyo challenges them to understand the misery of peasant life); neither can he ever hope to regain the identity of a peasant, for he finds their wretchedness and desperation too repulsive. In the eyes of Kimbei, Kikuchiyo is irresponsible and selfish: when:Kikuchiyo runs off to infiltrate the bandits’ camp and comes back with a captured gun, rather than congratulate Kikuchiyo, Kimbei berates him for leaving his post and endangering the rest of the village. We then see the price of Kikuchiyo’s vainglorious attitude immediately afterwards: the next bandit attack punches through at Kikuchiyo’s post and ends in the death of Gorobei, his friend and fellow samurai. Although Kikuchiyo takes his duties far more seriously from this point on, his recklessness still proves to be his downfall. After the master swordsman Kyuzo is slain, Kikuchiyo charges madly into the gun of the bandit leader, perhaps because his need to distinguish himself as a hero carries him even to the point of death. In this version of The Seven Samurai, the audience realizes that life is all about responsibility to one another; we understand and accept why Kikuchiyo died, and everybody goes home without any difficult questions. Except that: Akira Kurosawa is well known for being a staunch supporter of individualism, and it seems unlikely that he would make a film that was so morally simplistic and one-sided. Except that: research studies like Youichi Ito’s have already told us that the Japanese aren’t nearly as conformist in their attitude as many stereotypes imply. Finally, except that: at the movie’s conclusion, when we all should be celebrating the victory with the villagers, we find ourselves instead with Kimbei, who somberly admits that he has lost, once again. At first, the comment seems mysterious: aren’t all the bandits dead? How could they have lost? Even Shichiroji, standing right next to him, cannot discern what Kimbei means. But then the camera cuts back to the burial mound where four of the seven samurai are now laid to rest, and we see. More than half the samurai died protecting the peasants’ village, and now that the battle is won, the villagers have no more use for them. Witness how the villagers ignore the samurai standing by the cemetery while they dance and sing, or the way that Shino avoids Katsushiro’s glance and moves on to work in the rice fields; this is hardly the triumphant scene the audience expects after three and a half hours of film. 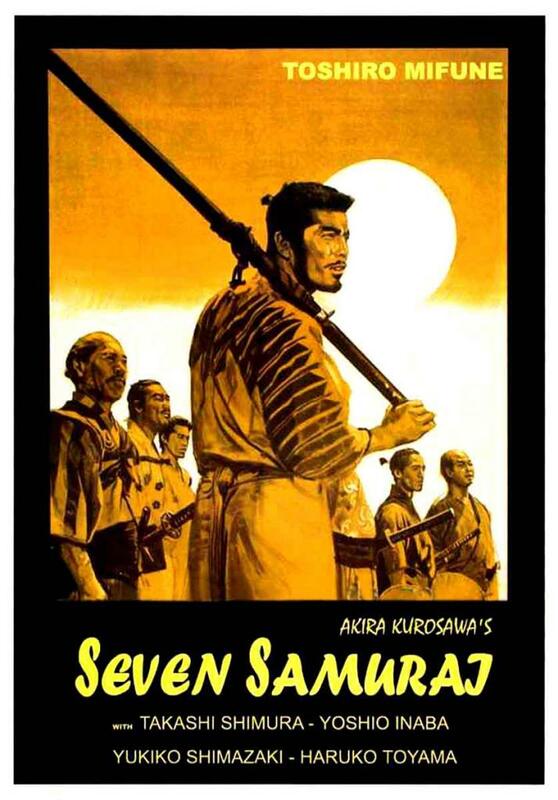 It seems also worth noting here that the ending of this film is extremely atypical for the genre of samurai movies, or jidai-geki (which translates roughly to “period drama”) with which The Seven Samurai is usually associated. While most samurai pieces encourage and celebrate the rise to heroism of an individual male lead, in Kurosawa’s picture there are a number of significant male parts, and each of them is harshly discouraged from taking any position of prominence within the picture. Even though Kimbei Shimada becomes the natural leader of the samurai and the village over the course of the film, his inability to protect his fellow samurai demonstrates his own fallibility and makes him unworthy of the mantle of a hero. Indeed, one of the most ironic things about The Seven Samurai as a jidai-geki is that the character with the deepest development and greatest charisma, Kikuchiyo, meets his tragic end at the hands of the enemy and so his story ends before the film ends. Yet while it may seem initially that Kurosawa destroys Kikuchiyo in this picture to make a point about the need to work together, the tragedy of Kikuchiyo’s sacrifice could also be interpreted as the hardest blow the film could strike against collectivist doctrine. Consider the characterization of the major “groups” in this film: the peasants appear desperate, then are revealed to be dishonest and manipulative (their hidden stores, which they decide to make use of before the final battle, suggest that their fear and desperation are in many ways no more than tactics of manipulation); the samurai are strong and noble, but destroy themselves for the sake of peasants who don’t even trust them; the bandits seem like stereotypical agents of evil, but by film’s end are revealed to be merely hungry and in search of employment, a position scarcely removed from that of the supposed “good” samurai at the film’s beginning. Once we begin to see the desperation and fear that runs even through the bandits, it becomes nearly impossible to make a hero of anyone. Kurosawa’s picture is not a story of great warriors and vicious thieves, but of three impoverished and blind groups of people fighting each other for survival. Enter into this maelstrom the character of Kikuchiyo, whose unique family history and attitudes, as mentioned earlier, make him the only character who cannot be grouped. Only he can speak to the peasants when they will not emerge from their houses. He knows that they understand only fear and uses their greater fear of the bandits to get them to trust the samurai. Only he can speak to the samurai. When Kyuzo is so angry at the peasants that he says he wishes he could kill them all, Kikuchiyo challenges him to understand the miserable fear that peasants live in during every waking moment. What if Kikuchiyo’s death, instead of being a consequence of his reckless glory-seeking, is actually the one time that he makes the mistake of sacrificing his safety for that of undeserving peasants? What if the reason Kimbei survives is that he cannot cast off his own identity as easily as he thinks he can? Witness how Kimbei rubs his head constantly in moments of indecision. Is he remembering the individual identity of his hair that nags at him even after it has been shaved? War exploits and sacrifices the individual for its own ends: this is the conclusion to which The Seven Samurai comes. It’s understandable that Kurosawa would reach this conclusion in 1954; after all, it was only a few years earlier that Japan had learned the consequences of thinking only with the group. In many ways, this awareness of the dangers of group-think is the most misunderstood thing about Japanese culture. Although their society does place a high premium on working together to accomplish goals, studies have shown that Japanese people tend to be more individualistic than Westerners. Where Westerners might use a single set of personal beliefs to guide them through any multitude of contexts, the Japanese tend to allow their situation to tell them how to behave (Ito 244-245). As films like The Seven Samurai demonstrate, decrying Japanese culture as a “mindless collective” is to grossly oversimplify the dynamism and complexity of one of the world’s most economically powerful nations. Ito, Youichi. “Theories of Communication Style from a Japanese: Perspective: A Sociological Approach.” Comparatively Speaking: Communication and Culture Across Space and Time. Ed. Jay Blumer, Jack McLeod and Karl Erik Rosengren. California: Sage, 1992. 238-268.